Adds legendary slot to ACR-W17 and allows crafting of ACR-W17 at 2lm workbench. 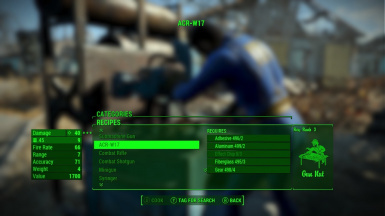 Adds legendary slot to ACR-W17 by N7R and allows crafting of ACR-W17 at 2lm workbench. Note I play on survival with Legendary Modification so that it requires effect chips to make and mod weapons. I'm not sure if Normal, Easy or Cheat will work the same (I'll check later). Thanks to N7R and teaLz for their great mods, Please show them love and endorse their mods. Let me know in the comments if problems occur.